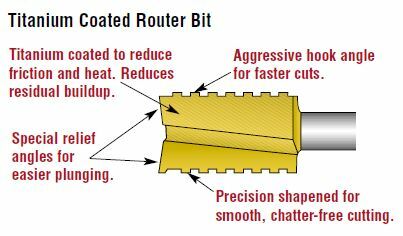 Vermont American router bits are precision-engineered to provide the smoothest, most accurate cutting for professional craftsmen, carpenters, do-it-yourselfers and hobbyists. Available in carbide tipped, titanium coated and high speed steel styles. Carbide Tipped – Specially formulated carbide grades for superior durability and cutting edges. 1/4” and 1/2” shanks are available. Titanium Coated – Titanium nitride coating reduces heat and friction. Available with 1/4″ shanks. High Speed Steel – Optimizes quality of cut in woodworking applications. Ideal for the occasional woodworker and do-ityourselfer. Available with 1/4″ shanks. Razor sharp cutting edges are diamond honed for satin smooth cuts. Radial relief eliminates friction and chatter. Optimized hook and shear angles for faster chip clearance and quicker feed rates. 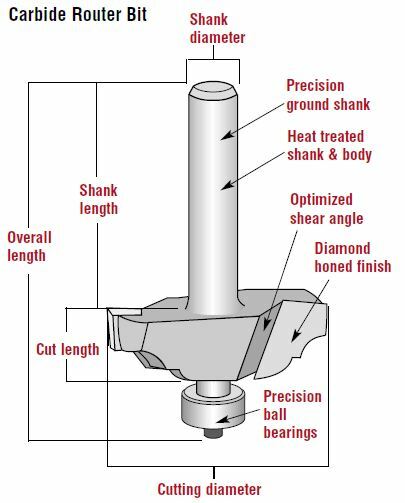 Ball bearing guides on selected edging and trimming bits prevent burning and marring. Triple tempered shanks for maximum durability.